I think your misinterpreting who is in your group. Professors and Scientists have earned their (respected) titles. That is why no one argues the science behind the fluxuating pressure (Ideal gas law). But these guys aren't stating that nothing happened, just that it could happen and that science could prove it. Unfortunately "Deflategate" involved many factors and a controlled scientific experiment wasn't one of them. You are putting the proof on Brady to prove his innocence. All the scientists did was offer a valid counter explanation to the reduction in PSI. There was NOTHING that actually tied Brady to the lower PSI levels on those footballs. If the situation is unclear, you have to let the guy go. But Goodell punished him because of people like you who wanted blood. You were tired of the Pats winning and thought it was going to be the death knell to this franchise. Instead it did the exact opposite. Without deflategate, the team doesn't rally around Brady to win 2 more titles, so thank you from the bottom of our hearts. Last edited by TommyBrady12; 01-26-2019 at 12:06 PM. Dude...rallying around cause you cheated and got caught is not the way we raised our kids, nor would we mentor anyone! It is a pathetic argument. It justifies cheating and poor character. Maybe his teammates don’t think he did anything, genius. Actually, the Amicus Brief absolutely stated the balls weren't lowered below 12.5 psi prior to the game - or - the half time readings would have been lower. And like Goodell said towards the end (paraphrasing) - it wasn't about PSI anymore. He did what he wanted, regardless of the facts - and ultimately the court upheld his power. NFLPA should have negotiated a better collective bargaining agreement. Last edited by Mainrnxile; 01-26-2019 at 01:41 PM. I'm at a loss as to how anybody still believes Exponent and the NFL regarding Deflategate. The scientific community made both entities look like buffoons. Dudes were suspended, fined, fired, and draft picks we're taken. Those things didn't happen because some guy was overweight and the league needed to save face. Roger Goodell is not some genius just because he’s commissioner. The guy graduated from some community college equivalent institution. Why is it so hard for you people to understand that just because he makes some ruling it does not mean it was correct?. I know that was meant to be a "degrading" comment..."genius"....but given the source it does not offend me. But here's your problem dude, you call me out with that sarcastic tone, but you missed the shiny point. I said that people who cheat....the patsies...should not be rallying around after they got caught. Which they did. Because if that's a rally point, that means every time someone cheats, we should all embrace them. But we don't. But in your reality, a cheater should get mad and do everything possible to win, so as to make all non cheaters feel bad about themselves. You got it so backwards! But then again, you are probably a teenager at most...so it makes some sense. Not meant to be an insult at all. Not everyone thinks he did something wrong, something which is hard for you to grasp. It was an insult but whatever....you matter not to me. But why is it so hard for you to grasp....he was guilty. He lied. He got caught. And rallied from what....cheating and getting caught. One of the goofiest things I've heard here lately. If for a second, TB can't tell the inflation pressure, he's an idiot and figure out the rest. Amen. For whatever reason, you can’t get into your head that not everyone is with you on this and that it’s not just Pats fans. But whatever. It doesn't matter what you think - his teammates believed him and the team got 2 more super bowls out of it. Now I suggest you move on to discussing the super bowl, the topic of this thread. 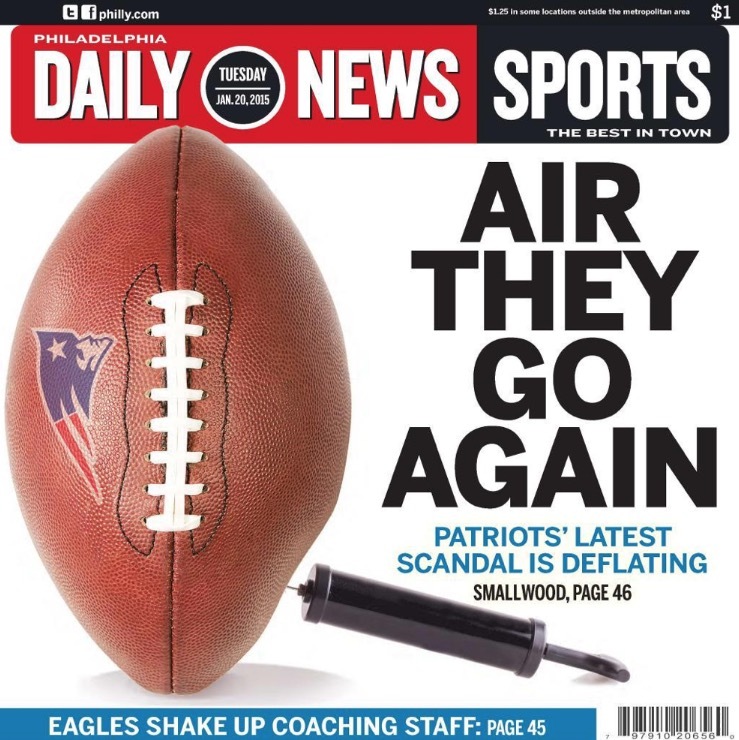 Not sure why all those things happened - but it wasn't because the Pats let air out of footballs - there are dozens of articles across the www. Outlining that fact. As for the 2nd Circuit Court - that case dealt with Goodell's authority under Article 46 of the CBA - not air pressure in footballs. There are dozens of articles across the www. Discussing that fact. Not sure why you're confused - even the slightest effort would provide you plenty of info on the matter.